Premium Quality 7753 Black Printer Ribbon (6 pk) compatible with the Epson LQ-200, 300, 400, 450, 500, 510, 550, 570, 580, 800, 850, 870, FX 70, 80, 85, 86, 90, 850, 870, 880, ActionPrinter 2000, 3000, 4000, 5000, L-1000, T-1000, MX 70, 80, 85, 86 Also fits some Citizen, Compuprint, HP, IBM, Olympia, Tally, and Unisys. The use of compatible supplies does not void your printer warranty. Premium Quality 7754 Black Printer Ribbon compatible with the AMT LQ 1000, 1010, 1050, 1070, 1170, ActionPrinter 4500, 5500, L-750 Also fits some AMT, Citizen, CompuPrint, Olympia, Talley Genicom, Unisys, and Samsung. The use of compatible supplies does not void your printer warranty. Premium Quality 7754 Purple Printer Ribbon compatible with the AMT LQ 1000, 1010, 1050, 1070, 1170, ActionPrinter 4500, 5500, L-750 Also fits some AMT, Citizen, CompuPrint, Olympia, Talley Genicom, Unisys, and Samsung. The use of compatible supplies does not void your printer warranty. 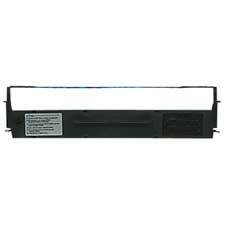 Genuine OEM Epson 7754 Black Printer Ribbon. They are designed to work in the Citizen 224 printer/copier(s). Genuine OEM Epson 7755 Black Fabric Ribbon. They are designed to work in the Citizen 224 printer/copier(s).